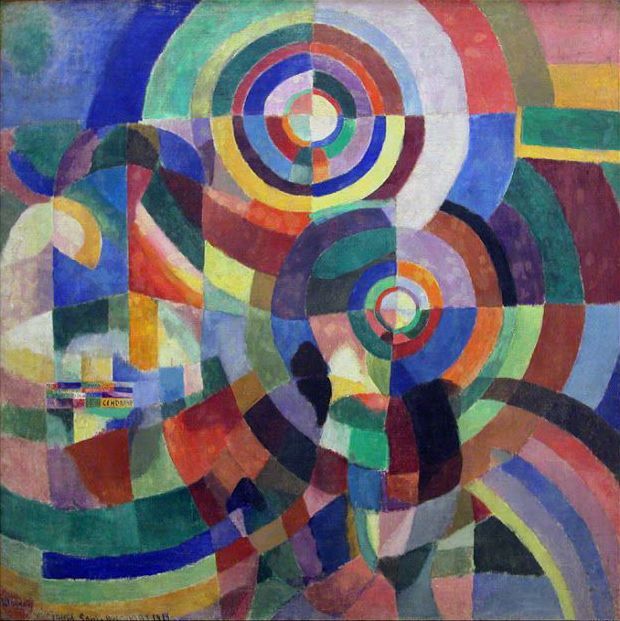 The below artworks are the most important in Orphism - that both overview the major ideas of the movement, and highlight the greatest achievements by each artist in Orphism. Don't forget to visit the artist overview pages of the artists that interest you. 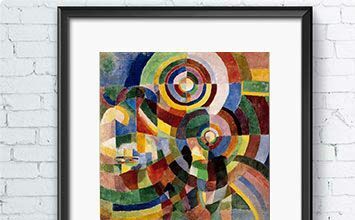 Artwork description & Analysis: Delaunay considered this monumental painting (13 x 9') a turning point in his work, and suggested a larger, metaphysical continuum of time and experience. Intended to be a visual manifesto, he incorporated elements of modern fragmentation while juxtaposing them with classical allusion and historical scale. The work combines fragmentary views of Paris and elements of its history, beginning on the left with the Quai du Louvre, representing ancient Paris, and, ending on the right with the Eiffel Tower, symbolizing the city's modernity. Reflecting Orphism's emphasis on depicting modernity's simultaneous states of being, this work conveys the fleeting sensations of modern life in Paris. He had first explored imagery of the Eiffel Tower in 1909, and it was to become a central symbol in his work. 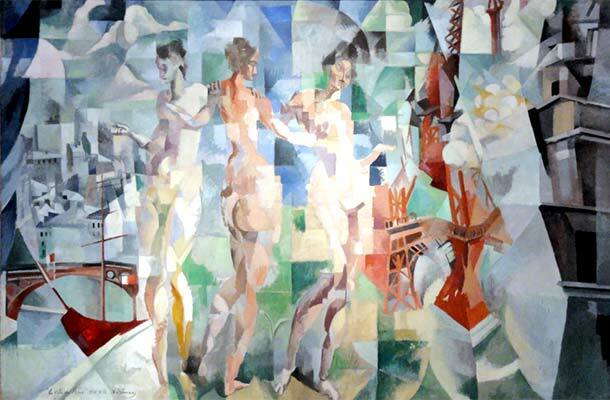 Delaunay also added the symbolic layer of the three women; their fragmented figures represent Paris of the past, the present, and the future while alluding to the Greek myth of the Judgment of Paris. The women were partly inspired by a wall painting of the three graces from ancient Pompeii. Artwork description & Analysis: The patchwork blanket, made of 70 triangular and rectangular pieces of cloth, is arranged in contrasting patterns along a roughly designed grid, creating a softly harmonious but dynamic effect. The dominant horizontal and vertical lines are counteracted by triangular patches, which introduce subtle diagonals to provide a sense of vibrant movement. The arrangement of black rectangles, green triangles, and small vertical rectangles of yellow in the center of the work create a sense of depth, as if looking into deeper space, yet the textile remains an insistently flat surface, creating visual tension between illusion and reality. Artwork description & Analysis: This work, depicting Adam and Eve in Paradise, marked the young Baranoff-Rossiné's debut as a modernist and demonstrates his early adoption of Orphist ideas. 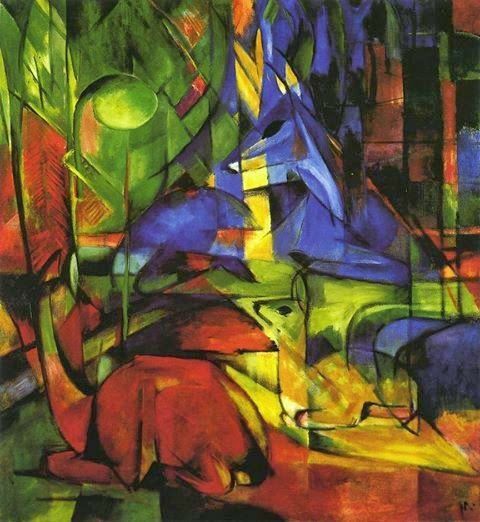 Like Delaunay, he intended the painting to make a grand demonstration of the meaningful potential of harnessing color and form to make meaning; he incorporated traditional symbolism, quoting Old Master works, to underscore its ancestry. Indeed, Adam's posture and profile alludes to Albrecht Dürer's 1504 Adam and Eve, but, unlike Dürer, the artist portrays Eve as a supine and seductive being, accompanied by a cat which symbolizes sexuality, drawing from more recent fin-de-siècle iconography of the femme fatale (Adam is attended by a faithful hound). A solar disk swirls at the center of the canvas, and six rings radiate around it, representing the Biblical six days of creation. The vegetation growing out of the third ring creates a sense of vibrant growth, in which can be seen fragmentary and amorphous animals. Artwork description & Analysis: This view of Paris, centered on the Eiffel Tower, recognizable as a green silhouette, appears throughout Delaunay's Simultaneous Windows series. Conveyed in translucent, overlapping, and contrasting color planes, the window serves as a framing device and a way of overlapping interior and exterior spaces in the painting. The influence of Symbolism can be seen in the artist's use of the Eiffel Tower as a symbol of modernity, and also in his use of windows, as Symbolism used images of glass to symbolize the connection between internal and external realities. Although the work was based on a photographic postcard, it also shows the influence of Sonia Delaunay's quilt in its grid-like pattern of rectangular and triangular planes. 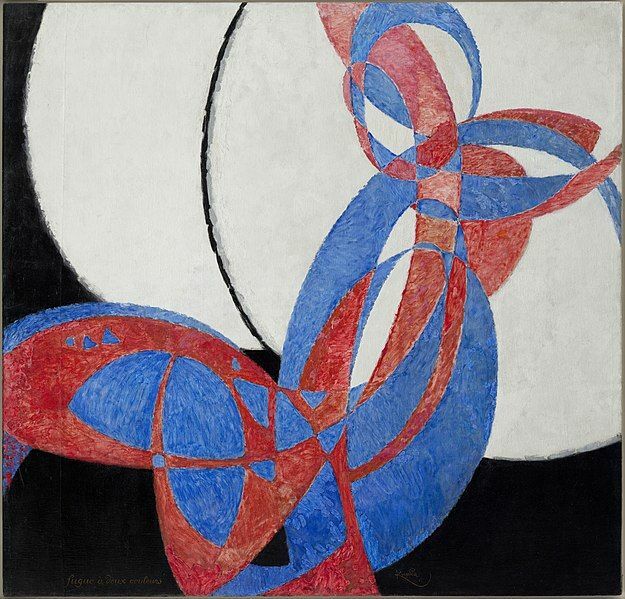 Artwork description & Analysis: In this work, the artist uses a highly simplified palette of blue, red, black, and white, combined in a series of arabesque patterns. The simplicity of the work is, however, misleading; Kupka made 27 preliminary studies for this work. His earliest sketches from 1907-1908 were representational, depicting a girl making a circling motion with a ball in her hand. Over time, he focused solely on her movement making the result increasingly abstract. To a viewer unaware of the preliminary drawings, the painting would appear completely non-objective. Artwork description & Analysis: Robert Delaunay joined Der Blaue Reiter in 1911 at the invitation of Wassily Kandinsky. 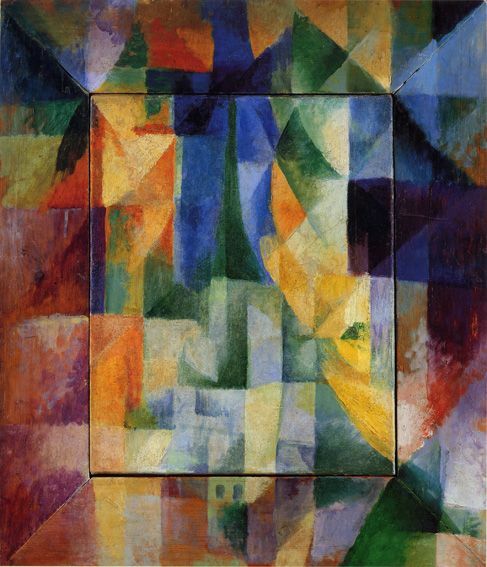 Orphists and the Expressionists both argued for the evocative and dynamic use of color and form, thus their approaches to painting were highly compatible, cross-pollinating between Delaunay and some members of Der Blaue Reiter. And Marc, along with Paul Klee and August Macke, visited Delaunay's Paris studio in 1912. 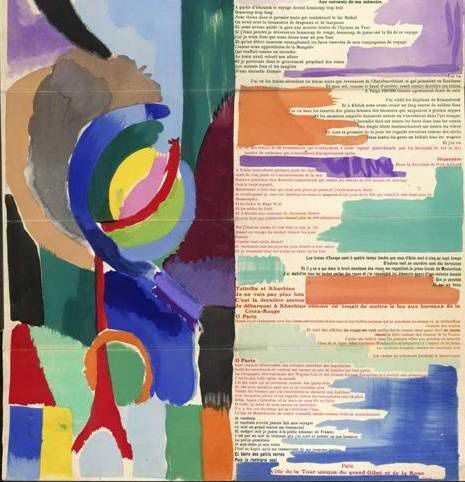 Artwork description & Analysis: Demonstrating Orphism's interdisciplinarity, this work was a collaboration between Sonia Delaunay and the poet Blaise Cendrars. More than just an illustration, Delaunay's swirling colors create an analogue to the poem, which describes a journey on the Trans-Siberian Railway during the Russo-Japanese War and the Russian Revolution of 1905. 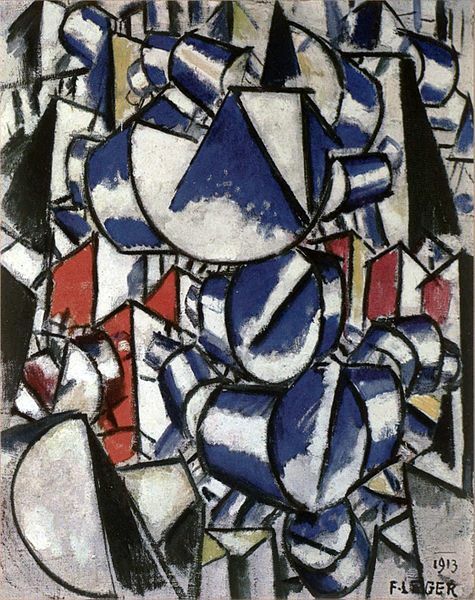 Artwork description & Analysis: The first work to explore Orphism's use of contrasting colors on a monumental scale, this twelve-foot long painting depicts a view of dancers and dancing couples under the dome lights of a Parisian dance hall. 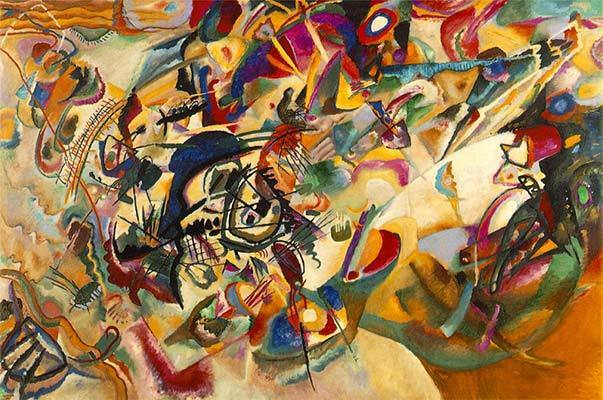 The dancers are fragmented into bright abstract areas of color, and the contrasts of red against green, purple next to yellow, create a swirling and energetic effect. The background is depicted in larger swathes of contrasting color, and the dome lights, haloed with concentric rings, resemble the emblematic solar disks of Robert's contemporary paintings and point toward Sonia's subsequent abstraction, Prismes electriques. Artwork description & Analysis: This work is electric with color, radiating from the two large circles at the center. The concentric rings and arcs are depicted in contrasting primary and secondary colors that overlap and become prismatic. In the rest of the painting, partial circles like halos cast by a light are broken by geometric patches that convey glimpses of the sidewalk beneath, at the lower right, and a building in the center left. This fragmentary landscape has been engulfed and dwarfed by a larger dynamic realm of sensorial color and pulsating form. First published on 11 Sep 2017. Updated and modified regularly.